e furi a chi ben vive ogn'ira e tedio. It was his last obsession: "Il Cristo con un'altra figura di sopra" - The Christ with another figure above. Mary, it would at a guess, but the point at which the statue remains, the face and body are rough-hewn and indistinct, the second figure remains open to interpretation, in the inventory taken of the contents of Michelangel0's studio on his death at about 89 years old. The statue was valued at about 30 scudi, the yearly wage of a modest school teacher, or, to put it another way, about half the sum Daniele da Volterra spent on wood to build a scaffold for the PGing of the Sistine Chapel, that same year. Michelangelo was never still, it seems. His final years found him back once again in Rome to work on the Pauline Chapel in the Vatican, yet found time to make three versions of the Pietà. The other two are in Florence, This was the last of the three. Even in very advanced years - especially for a period in which to live to be 60 or 70 was considered extraordinary - Michelangelo continued to accept and to squabble over commissions. Not least the news that his work in the Sistine Chapel was about to be revised; although knowing that a close collaborator was going to censor the naughty bits may have helped. Perhaps he was immune, after so many battles with patrons and Popes. Perhaps not. Unfinished, this Pietà, because out of time. Like many of his poems, the statue seems a dialogue with death, not a glorious passing or a final judgement, but with the failing of the light, the loss of power, the melting back to dust. On the Medici tombs at S Lorenzo the detail of faces of Dawn and Twilight, Night and Day remain unfinished, slightly vague, an allegory of the fading of day escaping notice, until it is too late. Here, death and loss seem frozen in time and in the act of creation. Halfway between an emerging and a fading back into the earth, one wonders if the figures are coming towards us out of the marble, or receding back into it, losing their hold on a defined existence outside the rock. Two figures, sharing this fate, fused at the torso. Marks on the statue show that originally the upper body of Christ was detatched. 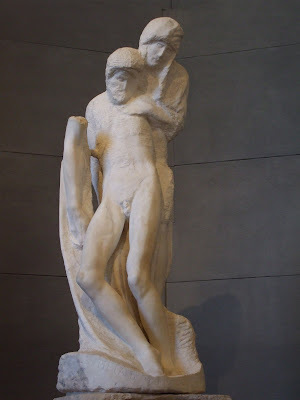 In his final version, the two come together in a single gesture of support given and taken, the smooth muscular legs of youth giving way, relying on the power of the rough hewn stone. The faces are unfinished, lined, worn, for all the centuries set in permanent pity, for telling the same story over and again, resigned to the inescapable fate of loss and of being captured in that act of losing, the slipping away of things irreplacable. Mary's left hand rests lightly on his heart, a reminder of the fusion between the hand and heart of the maestro himself: "non si possono esercitare in modi che ben vada l'arti manuali, perché la mano è lo strumento delle arti." Limbs and arts, gli arti e le arti here are inseparable as they had been throughout Michelangelo's life: limbs painted, sculpted and celebrated in poetry, the hands that brought them into being, now at the end of their great career. The Pietà was not a commissioned piece; Michelangelo's servant Antonio del Francese got it as a keepsake, on the death of his master. Shortly afterward it disappeared for a couple of centuries, to reemerge during the 1700's in the collection of the powerful Marquis Giuseppe, the last of the Rondanini family, when his palace in via del Corso was sold in Rome. Cleaned up, the statue has remarkable power. The commissioners of the City of Milan bought it. I am not sure what that says about Milan, it seems a very acquisitively New World gesture to me, snapping up a trifle of the artist's work; or so it must have seemed at the time, covered in grease and dirt. Today the statue is hidden behind a semicircular screen in the lowest part of the Scarlioni room, the last item in a succession of Ancient stones that begins with the Romans, to end on this very Roman note. If you're curious, to see the rest of the room, you can click here .